There is an amateur radio group in Germany known as DL0SHF which transmits a 10 GHz (QRG = 10.368.025 MHz) beacon at the moon whenever it is visible at their site. The goal of this transmission is to detect the very weak beacon reflection. DL0SHF transmit a signal to the moon when the moon is visible at the site. The run 2 modes 50 and 500 W output, 20 seconds on, 40 seconds off. Last night, I managed to detect the beacon with a very simple receiving package. Amazing enough, using WSJT moon tracking data, the signal appeared right away when the moon appeared here above the trees. The signal lasts only 20 seconds but then 40 seconds later, it returned! By the books. I use a simple 10 GHz receiver here that I use for scouting signals on 10 GHz terrestrial as member of the San Bernardino Microwave Society. It consists of a RTL Dongle IF block tuned to 618 MHz as IF. The LNB is powered with 12 Volts by means of a Bias Tee. Both items can be acquired for about USD 25.- on eBay and other places. 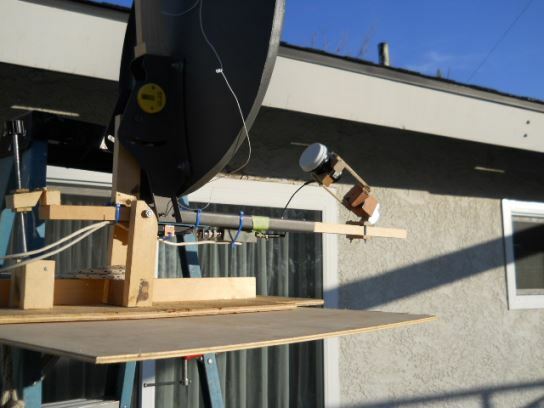 The antenna is a standard 18 inch satellite off-set dish. The antenna has some elevation control and the feed ( LNB ) can be rotated for polarity control. Every variable is manually operated. 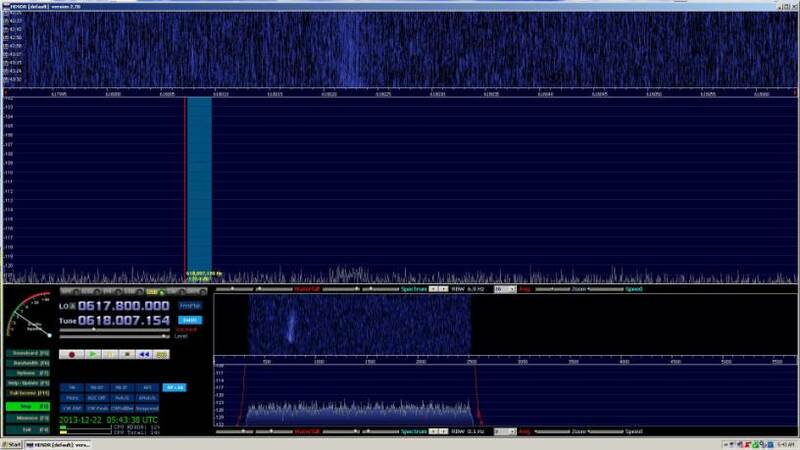 At times I measured the beacon as high as 15 dB above the noise using HDSDR as DSP processor software. The beacon was running in the 500 W output mode during these observations. You are right the signal’s travel time is 2.2″ (earth-moon-earth), but the beacon is 20″ on and then 40″ off, after that starts all over again. It means that the beacon just transmit only the first 20″ of any minute. 40 seconds to go to the Moon and back? Nonsense! Every schoolboy knows that it takes 2.2 seconds.